Call me an old woman but I'm typically not a fan of dining in pubs (restaurant-pubs aside). I just find it so uncomfortable! Piling winter coats on tiny bar stools, cramped around little tables and typically cheek to jowl with the next table. Then there's elbowing away the resident pub dog's nose from my plate. It's just not my style. But sometimes you just can't ignore the Instagram shots of gorgeous looking food any longer. And I've become a big fan of The Pond actually, probably due to my new interest in beer, they always seem to have something on that I absolutely love. Plus it's had a really nice makeover featuring illustrated murals from local design studio See Creatures and doesn't THAT hague blue shade make everything better? 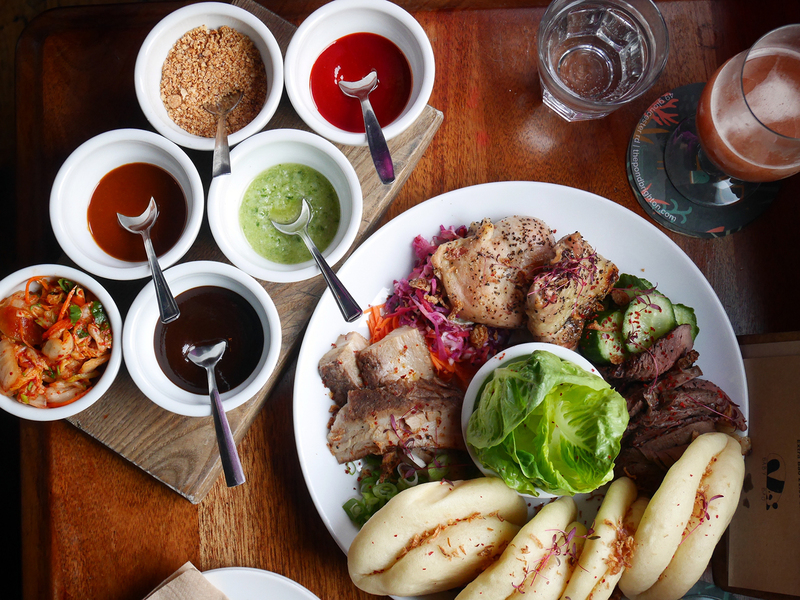 Before their residency at The Pond, Baby Bao had, and still do I believe, a regular Friday spot at Street Diner. Fitting as it's, well, street food. Where some have tried a bit too hard with pub food or gone concept hard, it's often failed. 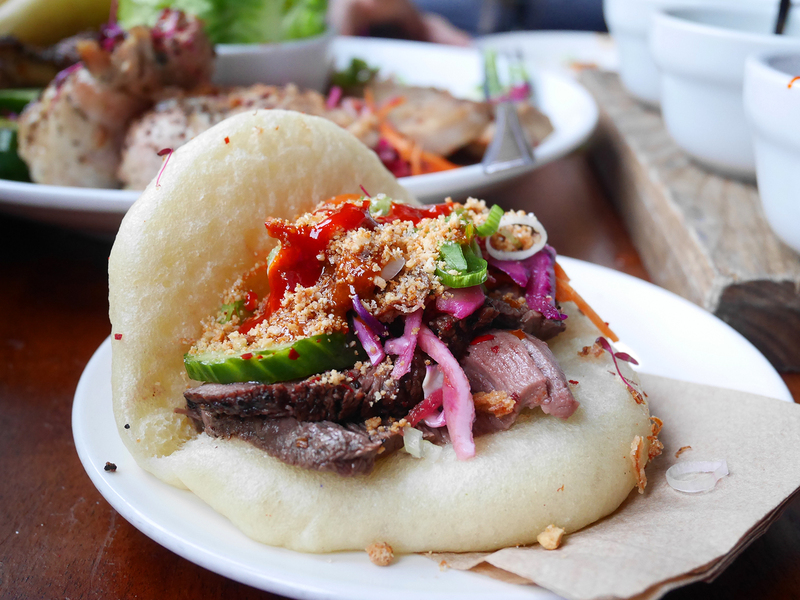 Somehow, the Taiwanese bao bun concept just seems to work well here. Affordable, delicious, vibrant and easily scalable if you want a quick bite or a full meal. 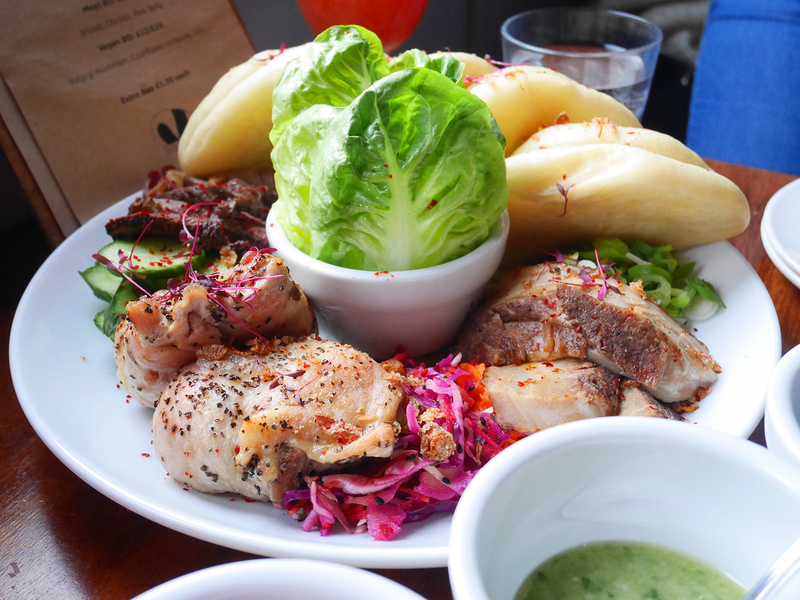 You can either grab a single or selection of the filled buns and there's the option of some really interesting sides. They cater particularly well for vegetarian and vegan diets here, and are exclusively meat free and vegan on Mondays with bao fillings like mushroom bulgogi and seitan brisket. 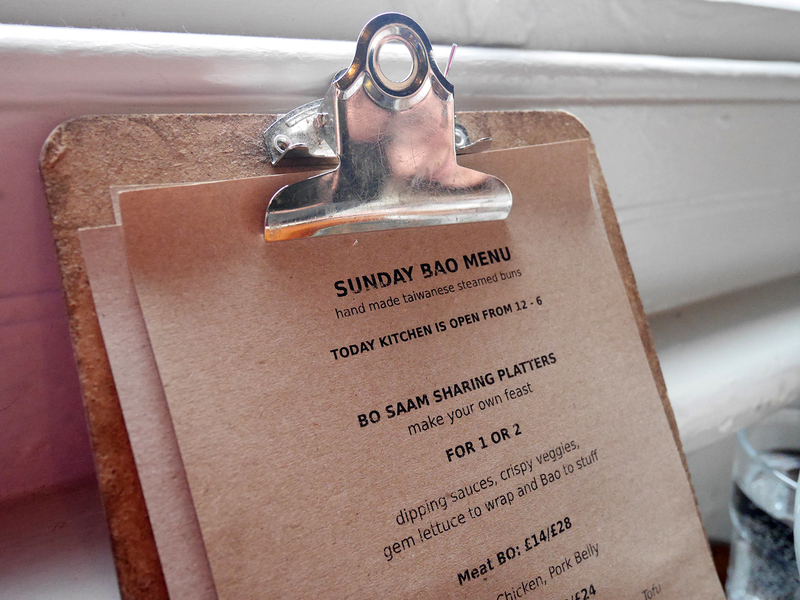 On Sunday, which is when I visited, they offer either meat or vegan Bo Saam sharing platters. This is such an interactive fun meal and a perfect alternative to the Sunday Roast. We ordered the meat option and you get classic pork belly, brisket and crispy chicken thighs. Visually it's impressive and full of colour. The steamed bao buns themselves are beautifully puffy and super light. You can then build your own filling from the platter of meats, pickled veg and sauces, wrapping remaining fillings with the crisp little gem leaves. Additional bao buns are available to order separately if you are ravenous but two were perfect for me. Yup. Crunchy, spicy, sweet, salty, savoury and sour - it has it all going on. So many flavours and textures that is a joy to eat. My favourite was the brisket but if you like melting, fatty cuts then the pork belly is for you. The kimchi could have packed a bigger punch but was still enjoyable and the sauces varied and all good. And, trust me, you'll want to sprinkle the crushed peanut powder on EVERYTHING. 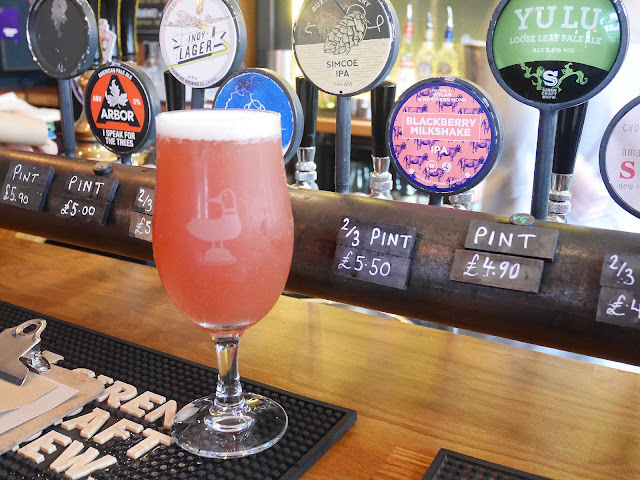 On tap was the Blackberry Milkshake IPA from Wylam and Northern Monk - probably the girliest beer in the world, a beautiful blush pink and crazily drinkable; fruity but softly bitter. Sadly we got the end of the keg otherwise I would have indulged in another three. I doubt they'll still have that on but every time I've popped in there's been something delicious; a blueberry stout that was pure dessert in a glass or Dark Star's Creme Brulee. The bao meat sharing plate was £28 for two or £14 for one. Individual buns are around the £5 and sides £4 so nothing is going to break the bank here. I didn't think to order dessert but now seeing a few shots of the donut bao filled with either matcha ice cream or peanut butter ice cream and jam gives me the weak excuse to return very, very soon.